Have you heard of bucket filling? In a nutshell it’s the daily action of being kind to others and the good feels that come with lifting others up. 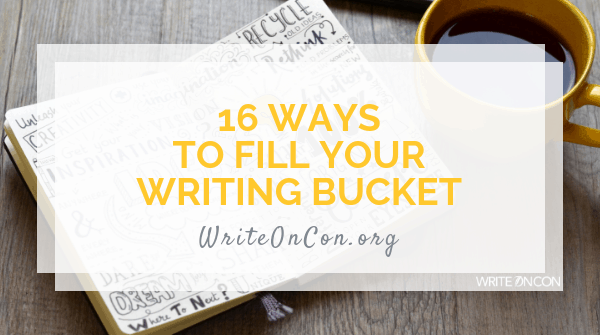 Now imagine that bucket is your writing soul, heart, or whatever you want to call it. Every time you succeed or do a good deed your bucket gets a bit fuller and you feel happy; on the opposite end, whenever a perceived setback happens (rejection, bad review etc.) your bucket leaks until you no longer feel like the amazing writer you were born to be. Here are a few ways to stop the happiness leakage and fill your writing reserve, because let’s be honest, being a creative is hard! 1. Leave a review of a book you loved on Goodreads or Amazon. 2. Comment on a writer’s blog post. 3. Recommend on Twitter, Instagram, or Facebook an author’s book or services you have enjoyed. 4. Write a thank you note to your critique partner or anyone that has helped you in your career. 5. Write a “what I love about your writing” note to your critique partner or an author you admire. 6. Suggest a book purchase to your local library. 7. Donate a book you enjoyed to a free little library. 8. Donate to a love of reading fund or similar organization that supports getting books into the hands of children. 9. Write a note about what you love about your writing and return to it on a day when you just aren’t feeling it. 10. Jot down 10 successes in your journal (everything counts, even getting that load of laundry you have meant to do in the machine). 11. Look at cute animal videos. I highly recommend pugs, sloths, baby anything. 12. Go for a walk or a run, or my favourite, boxing! 13. Make a coffee date with a friend in-person or online (try Google Hangout or Skype). 14. Watch a Ted Talk. I recommend checking out “Love Letters to Strangers” or “The Power of Story: Susan Conley”. 15. Get cozy with a beloved pet or take a warm bath. 16. Take 15 to read a book you love.